My Little Gramps - . And of course, he's extremely serious. That is exactly something my brother Chuck would have said. And yes, he was born a very old man. Maybe they can play canasta together. Bob is so beyond his years. I love it! I think he'll be joining AARP before he starts kindergarten. How true it is. He's so funny! 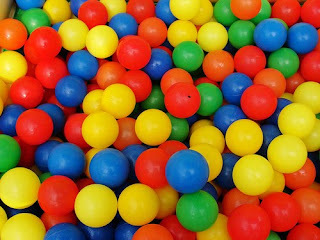 I tried not to think about those ball pits when my son was little..I knew there was no way they cleaned all those balls! Bob you are smart and you are wise. But dirt he has no problem with. Tell Bob that Swedish meatballs have germ-killing properties. ah, yes. my favorite bob is a grandpa bob.